Last week was the first week we were out at the summer house. The kids started camp— that’s Mazzy and Harlow on their first day up top. (FYI, Harlow’s top used to be a dress.) So far, all indications are that Harlow is having a much better summer than last year. Her counselors report that she is a completely different kid than they remember. I can see that. Harlow has two modes. Guarded silent intense Harlow and over-the-top hilarious dance-crazy non-stop-talking showman. I guess this year, they’ve finally been introduced to Harlow #2. Mazzy is having a bit of a tougher time. So far, there are mostly boys in her group, but Gavin, one of her closest friends who she usually spends the summer with, is away at sleep-away camp for the month of July. (This is bringing up a whole host of sleep-away camp questions which I think I’ll address in a future post.) Her other best friend is away for the first two weeks and will be starting camp next week, so I suspect things will be easier after that. Right now, I’m having a to do a little convincing in the morning to get her out of bed, but Mazzy is adaptable and usually happy once we get there. While Mazzy is excited to wear shorts, t-shirts and sneakers all summer long, trying to convince Harlow to wear anything but a dress is like trying to tell a fish that it can get out of the water and walk on the ground. She refuses. 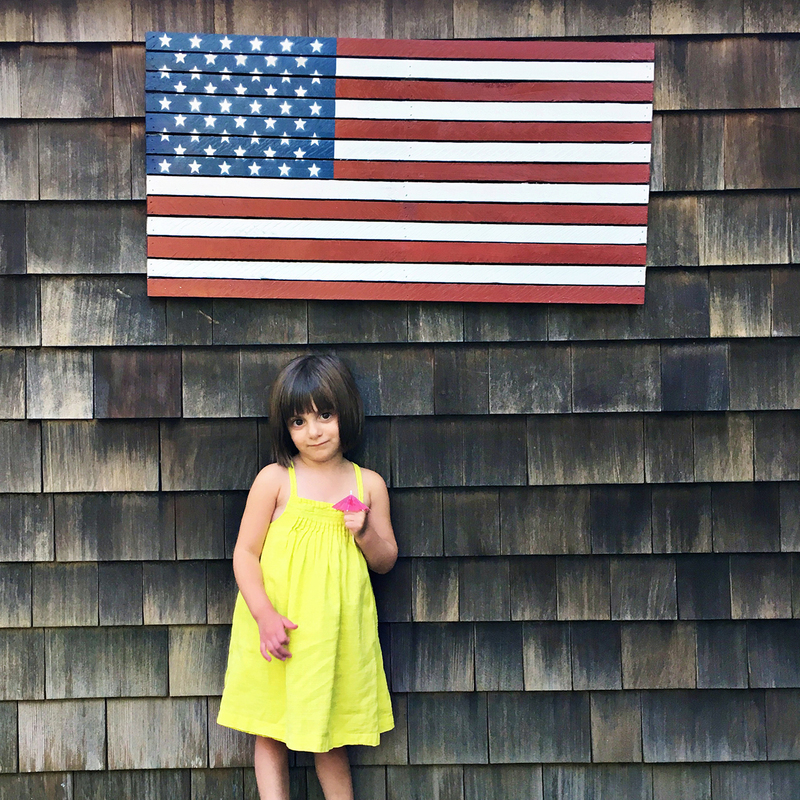 It might look like I convinced her in the photo below (that was on red, white and blue day at camp) but she begged me to pack an extra dress in her bag, which she was of course wearing when I picked her up later that day. For the weekend leading up to the Fourth, my sister and her family stayed at a friend’s house nearby and the girls spent much of the time with their cousins, Jack and Neve. They are all so ridiculously sweet together, I can barely stand it. Poppy and Nonna invited us all to a picnic in the park and while we were there, Mazzy discovered a free library box. Inside was the graphic novel Spirited Away and she proceeded to sit on a bench and read the whole thing from cover to cover. I think that’s the first time Mazzy has ever opted to read anything unprompted and it made me unbelievably happy. That’s totally who I was as a kid. I always had a book on me and would read on my own whenever I had the opportunity. While Mazzy was reading, Harlow picked me a bouquet of wild flowers and I felt like I was living inside some other mom’s perfect parenting fantasy world. To make things even cuter, Harlow went over to the library box and found a Patty Cake book. She can’t read but she knows the words to Patty Cake so she started “reading” it to Neve. Then all four of them sat together on the bench reading and my sister and I took about 1000 photos because what else do you do when your children are at a distance acting like perfect angels??? We told them it was time to eat, so they came over to our spot on the grass, pulled out their reclining chairs and continued reading. FINE BY ME. The picnic ended with a local band playing a concert in the park and I really think the whole scenario ranks up there with one of my favorite evenings ever. Thank you, Poppy and Nonna. I should also mention that Neve was wearing my favorite hand-me-down from Mazzy and Harlow. They both wore it on their first day of preschool. Oh, how I miss that dress. After the picnic was over, we went to the beach at sunset— my favorite time to go. When the sand isn’t too hot to walk on and everyone else has already gone home. Later that night, we took the girls to see the fireworks in Southhampton. Our view was partially blocked by a tree, but it was good enough. Over the rest of the weekend, we visited friends who for the purposes of this post, can mainly be distinguished by their pool floats. This is Seri’s peppermint candy pool float. And this is my friend Lucy’s toucan. It’s about 20X the size of Harlow. I was also bitten by the pool float bug and went to Target to buy a doughnut and a unicorn. I blame Instagram for the surge in pool float options and popularity. I don’t think Mazzy has ever been so excited to look through my grocery bags. We also went to Seri’s house for Luke’s annual summer bash, otherwise known as his 5th birthday party. We go to Luke’s party every year and it was interesting to note how much it has changed since last year. Mainly because nobody has babies anymore. Everyone has walking/talking/running full blown kids so the party seemed twice as crazy and crowded as usual, even though for the most part, it was all the same families in attendance. Interestingly, crazy did not equate to less relaxing. Quite the opposite. Both Mazzy and Harlow did their own thing the entire time. They swam in the pool (Seri hired counselors from camp to lifeguard), ran around the grass, jumped in the bouncy castle and we didn’t hear a peep from them all day. Harlow usually takes a good hour to warm up at a party (always ready to get the party started just as it’s ending) so it was awesome to see her run off and have fun immediately. Mike and I got to eat, drink and talk to the adults. The actual Fourth of July was pretty low key. The kids had red, white and blue day at camp. Here’s the series of photos I posted on my Instagram Story which is a pretty good indication of how hard it is to take a good photo. Yep. Harlow did actually make that suggestion which was pretty adorable and totally appropriate. Good work, Harlow. I finally got a good shot before we left for camp. Mazzy opted for a bomb pop, remarking how it was perfect for the holiday. Harlow opted for a Power Puff Girl Popsicle, which has blue and black dye along with hard-as-a-rock gum ball eyes and makes for an absolutely TERRIBLE dessert, especially when you take into account how fast that thing is going to melt. When she was done, Harlow looked like Night of the Living Dead. After everyone was cleaned up (which required full-on showers), we ended the night with sparklers on the deck. Mike stayed out at the house all week then returned to the city last night, which means the official start of my summer routine is today (Monday), when I have to go it alone with the kids all week until he gets back here on Friday night. No offense to Mike but I’m looking forward to it. I get a lot done when he’s not here. Plus, I get to watch whatever TV show I want (currently in the middle of Season 5 of Orange is the New Black). The kids were great this morning, getting up and getting ready without much of a fuss. We were up early enough that I got to squeeze in a workout (I ran around our yard and then worked out with weights and the foam roller) before we left for camp. Harlow was a little weepy at drop-off today but I’m almost certain it was all for show. Then I picked up Allie at the train station and we are currently working at Little Miss Party’s place until camp pick-up at 4pm. She feeds us. This was lunch, in case you need any indication how our day is going. So that’s it. Summer so far. It’s pretty sweet. To follow my day in real time, follow @mommyshorts on Instagram and ilanawiles on Snapchat. LOVE THIS POST! SUMMER RULES. And I miss Gavin too, Mazzy (insert emoji with that little tear running off his forehead). I know how you feel about unprompted reading. I can’t remember ever NOT reading and I try to encourage all my nieces and nephews to read ( I’m not a parent, but have helped raise quite a few of them). I noticed Mazzy appears to be squinting in one photo, hopefully it’s just glare from the sun. Have a great summer. I love love love the 4th of July photo attempts. My 5 year old has still not mastered the “mostly natural-looking” smile for photos. I like to continue on with the attempts until either I’m mad at her for smiling like a demented person or she’s on the verge of tears. Sometimes, depending on the weather, they both happen simultaneously. I also have a 2 year old boy who just doesnt give any fucks about smiling for mommy. He can give a boisterous “Cheese!” without breaking a smile at all. The struggle is so real! I too have 5 and 2 year old boys. My 5 year old is in a tongue sticking out phase in pictures and my 2 year old looks ready to eat someone. Outake 4th of July pictures…lol. my boys say mom uou have taken 100 pictures…yep and sad fact like only 5 will be decent and be worthy of saving lol.